I've gotten so much wear out of these adorable pants--I have them in every color and seriously cannot get enough of them! And, the best part is, they are on SALE! If you follow my posts, you can see that I like to throw a blazer on top of anything and everything to complete a look. Simple, but chic! 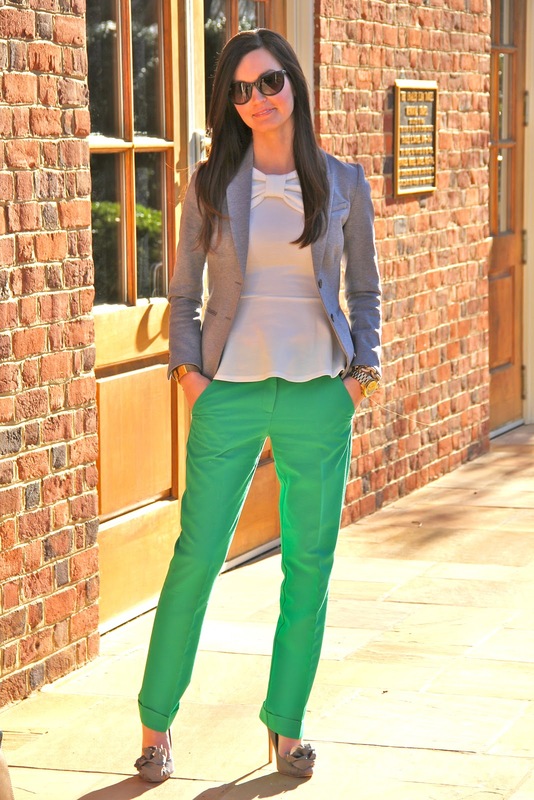 Those green pants are so fun & I love the bow peplum top...adorable look! Good Morning Megan! This look is lovely. I am really loving the neutral and the bright in these two shades. Kudos to the hubby, you've taught him well! Have a beautiful day! oh that's such a nice outfit! Those pants with the peplum top are so cute! Love that blazer! I feel like it is such a staple wardrobe piece! Love the green and the jewlery! I couldn't agree more about blazers, I love any and all! 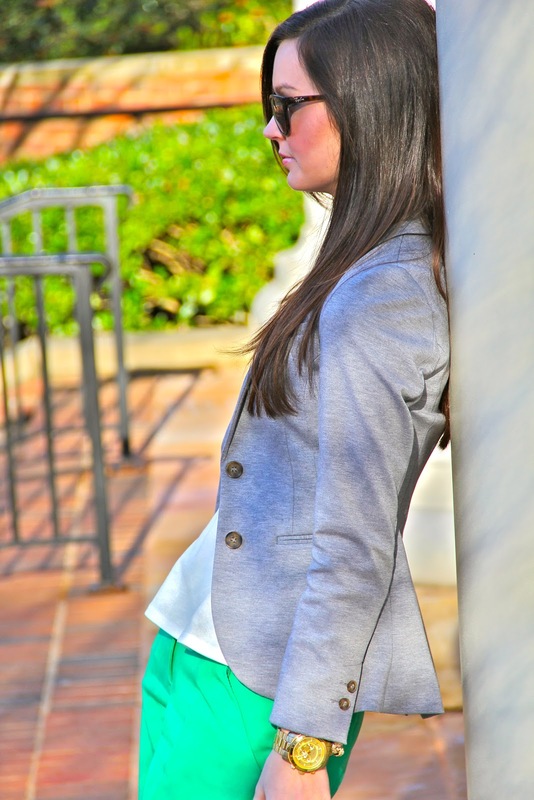 love the cotton blazer! your do know how to pull any outfit together in a chic way! also dear i am having a giveaway for an ily couture bracelet on my blog and i would love you would stop by and check it out!! I love the green pants!!! I am totally loving kelly green lately, it's so fresh. This is a beautiful look, love that bracelet!!! 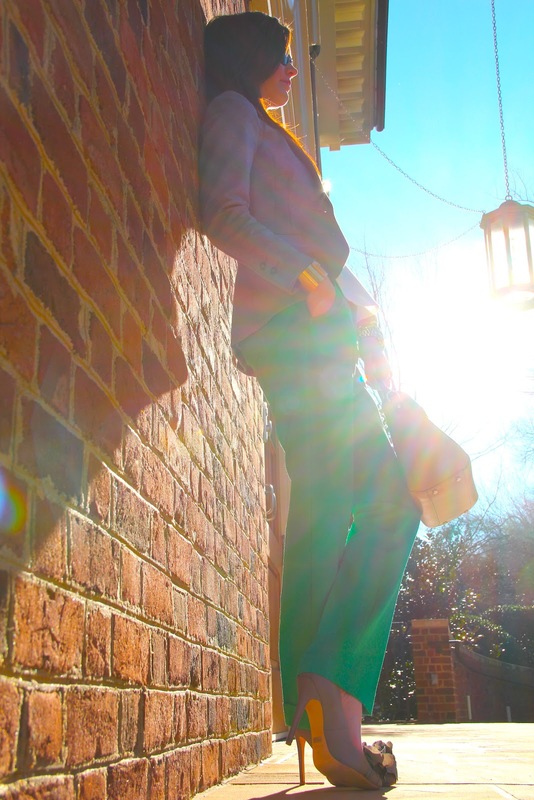 I love the jelly bean green and for $19 those pants are a steal! Great way to rock the emerald! Great outfit girl! These are gorgeous green pants! I, too, throw a blazer over everything, they're such an essential wardrobe piece! Love the accent on that top- and what beautiful photos! That top is super cute! Love the heels too! I love this outfit. That top is too gorgeous and looks fabulous with the pants. Love your style! Also, that bow blouse is adorable. I love the pop of color from your pants! Great look girl! 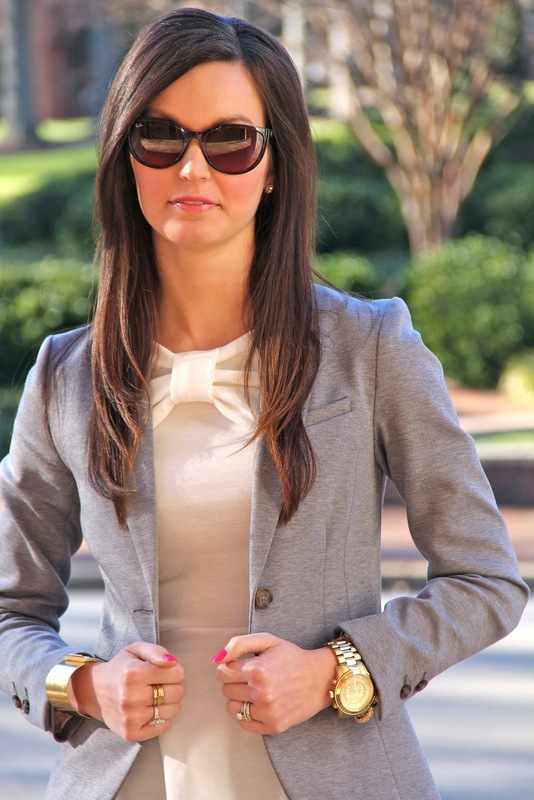 Love your bow/peplum top and your gray blazer:)! i'm loving those ladylike heels and your arm candy! How amazing you look, Megan! I'm so in love with those pants, I'm off to check them out :) And I'm obsessed with your crisp white peplum top (the bow detail is so charming!) You look fantastic! great outfit! I'm really loving your bag and shoes...you your top!! Gorgeous outfit! LOVE the cute bow on the neckline of that shirt! Love, love, love everything about this outfit! You're rocking those green pants and I like how the bows on the shirt and shoes tie together. I LOVE the bow on your shirt! Super cute. I love ALL things with bows!